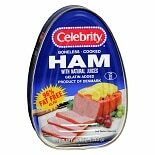 Shop Celebrity Boneless Cook Ham with Natural Juices (12 oz. )12 oz. 2 for 5 dollars and 00 cents or 1 for 2 dollars and 99 cents 3/$9.00 or 1/$3.49 $0.25 / oz.